Hi everyone! I’m so excited to be part of Good Choice Reading for the day! I want to thank Damaris for having me as a guest! 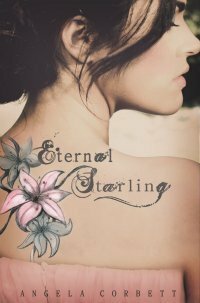 Damaris gave me a few ideas for guest posts, but the one that stuck out was a post about writing Eternal Starling. I’ve talked about my journey to publication, how long the book took to write, and where I came up with the idea, but I haven’t talked about the characters in the book. Sometimes, one of the hardest things about writing is getting to know your characters and finding their voice. For me, Evie was easy to write. I knew exactly who she was from the beginning, but Alex and Emil were more difficult. I wanted to write a love triangle where both guys had positive and negative character traits. They both needed to leave the reader wondering who to trust, and who was best for Evie. I knew writing two strong love interests and keeping their personalities different, but equally appealing, wouldn’t be easy. I was trying to figure out how to get to know them better when a friend sent me a getting to know you quiz on Facebook. I thought, hey, why not fill out one of these quizzes for Alex and Emil? As silly as it might sound, it really helped me get into the heads of my characters. Since I was already filling out quizzes for the guys, I also filled one out for Evie and it helped me get to know her better too. I thought it would be fun to share some of the answers from the quizzes with you, so I took some questions/answers from each character and listed them below. There are some hints about Eternal Starling and the trilogy too. 1. The phone rings, who do you want it to be? Channing Tatum, but chances are good it will be my mom. 2. Do you like to ride horses? No. I like four-wheelers…there’s less chance of being bucked off. Don’t get me wrong, I’ve been bucked off four-wheelers too, but that was my fault. Horses have their own agenda. 3. What was your favorite game as a kid? No Bears Are Out Tonight and Kick the Can. I lived in a small town and playing night games was the most exciting thing a kid without a license could do. We also used to throw ice cubes in the middle of the street to see how long it took a car to run them over. The winner got another ice cube. 4. Can you do the splits? By accident, but not on purpose. 5. How often do you read books? Every night. My favorite right now is Indelible, by Lani Woodland. I have a fictional crush on Brent. 1. Use three words to describe yourself? 2. Are you continuing your education? I'm constantly learning something, and have a degree in history…among other things. 3. If your house was on fire, what would be the first thing you grabbed? 4. How far did you travel today? It depends on the mode of transportation you’re talking about. I’ll assume we’re talking about cars, and since Gunnison is small, I traveled about 4 miles to Evie’s house. 5. Do you look like your mom or dad? People tell me I share a strong resemblance to both of my parents. I have my dad’s jawline and my mom’s bright green eyes. 1. Do you think more about the past, present, or future? Probably the past because it’s the most important part of my life, but I’m enjoying the present, and looking forward to the future. 2. Where is your dream house located? The Matrix. Things are never what you think they are. 4. If you could fast forward your life, would you? No. But sometimes I’d like to rewind it. 5. Do you know how to play poker? Uh huh. I’ve been playing it for a very long time. I think I’m pretty hard to beat. I’m also excellent at a game called Brag. Angela is giving away an AWESOME Eternal Starling jewelry and signed bookmark! Add Eternal Starling to read on GoodReads, or Tweet and Facebook about Eternal Starling. Then leave a comment with your NAME and E-MAIL letting us know if you've added on GoodReads, or spread the word about it on your twitter or Facebook. If you do all three, well heck, leave a separate comment for each and that will enter you EACH time! That's it! Simple right? Please NOTE: DO NOT leave a comment on this BLOG POST if you are not entering the giveaway. Since we are using Random.org I need all comments to be strictly about this giveaway. If you'd like to reach us or simply share a though with us, please use another post or send us an e-mail @ Contact@goodchoicereading.com. Anyone who pre-orders Eternal Starling can be entered to win a kindle. All you have to do it e-mail Angela (EternalStarlingContest at gmail dot com) a photo of the receipt, or a copy of the email receipt for proof of purchase. This contest has already begun and will continue until the Eternal Starlings release date on December 6th. How cool is that? Good luck to everyone!!! I've spread word and added the book! I added it to my TBR pile in Goodreads! I added this book as to-read awhile ago. I added Eternal Starling to my to-read shelf. I have Eternal Starling on my goodreads TBR list. I really like the sounds of this book, adding it to my wishlist. Thanks for the chance.